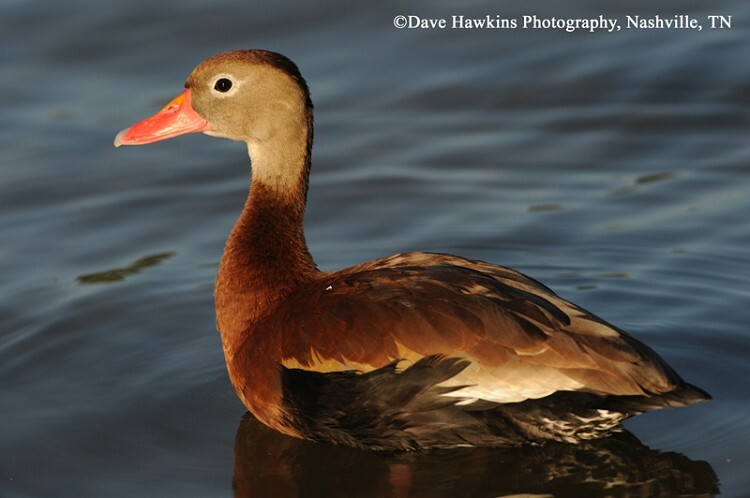 The Black-bellied Whistling-Duck is a distinctive-looking duck primarily found in Central and South America, but extending into southern Texas and Louisiana. It is a rare visitor in Tennessee and has recently been recorded breeding in the state! Its long neck and legs, black belly, and red bill make this an easy duck to identify. Description: The Black-bellied Whistling-Duck is a medium-sized, brown dabbling duck with a long neck, long pink legs, black belly, and a red bill on a gray face. The large white wing-patch is diagnostic in flight, and males and females look similar. Immature birds look like adults, but are more grayish brown with a mostly gray belly, and a gray bill and legs. Similar Species: The Fulvous Whistling-Duck is similar in body shape but is buffy on the head, neck and belly, and has dark wings with no white wing-patch. Habitat: Marshes, ponds, lakes, and other wetland habitats. Diet: Aquatic plants, grass, grain, insects, and mollusks. Nesting and reproduction: Nesting, though rare in Tennessee, begins in June with young hatching in mid-July. Clutch Size: They typically lay 9-18 eggs. Fledging: Young leave the nest shortly after hatching, but are unable to fly until they are approximately a month old. Nest: Nests are placed in cavities, including nest boxes, but usually without a nest lining. Status in Tennessee: Rare bird year-round in Tennessee, but more frequently reported in West Tennessee from late May through August. Recent successful breeding in Shelby, Lauderdale, and Madison Counties in 2008, 2009, and 2010 (when this account was written). First record of the species was in 1978 at the southern end of Reelfoot Lake when a pair was observed with 8 ducklings. The next nesting was reported in 1985, and then again in 1988. Whistling-ducks were formerly called tree-ducks. The name was changed because few of these species, including the Black-bellied Whistling-Duck, actually perch or nest in trees. While whistling-ducks look like ducks, they resemble geese and swans in that they lack sexual dimorphism, have relatively long-term pair bonds, and lack the complex pair-forming behavior found in most ducks. Like Wood Ducks and other waterfowl, some females will "dump" eggs in the nests of other females. Best place to see in Tennessee: Ensley Bottoms, aka the "Pits," in Memphis, TVA and Coro Lakes, Shelby Co.